Brian has a history of playing elite level tennis and coaching professional sports people. Brian is an active member coach at Umina Beach Surf Club, along with his wife and three children. 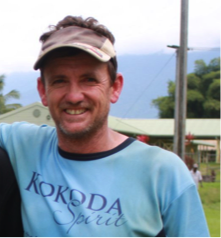 Brian started his journey with Kokoda Spirit in 2008 and over the past seven years has led many successful treks. Brian has great respect for the history of our past servicemen. Both of Brian’s grandfathers served and were wounded in World War I and his father served for four years during World War II in the Highlands of PNG. Brian’s respect for the local porters and villagers is matched by his passion for the history of the Track. Brian is able to bring to life the struggles and hardships endured by the heroes that fought on the Track; there is hardly a dry eye after the moving ceremonies he holds along the way. Brian has led many diverse groups over the years including a highly inspirational legally blind trekker but his most challenging and successful group has been the MASP Kokoda Youth Mentoring Program from Mildura. Since 2009 Brian has played a pivotal role in leading over 200 young people from MASP experiencing difficulties in their lives and their mentors across Kokoda. Brian is one of our expert Guides for our Corporate and Youth Leadership programmes.